During this time of year I enter night a bit further north every day during the commute. Daylight extends its stay, until I eventually arrive home without my headlights on. It is the toughest time of year to be driving late in the evening, then returning early in the morning. I have been traveling the route between Williston and Middlebury for almost nine years. As of this February I will have gone south on Brownell to Route 16, then Silver St. to Bristol Rd. and back again a couple thousand times. The final 15-20 miles has changed a few times, changing the connection to Route 7 from River Rd. to Town Hill, currently I am picking up Route 17 by traveling from Hardscrabble Rd to Sawyer Rd. Most of the time I am going the opposite direction of traffic, but the occasional honey-wagon can stretch the 45 minute drive to over an hour. Three cars have seen the majority of this routine. On the first day of the commute I was driving an emerald green 2001 Saturn SL. The car handled the travel well, and got very good gas mileage. There were a few times, mostly at night while the snow was falling, that the car would slide towards the edge of the road, and I felt that I would slip into a snowbank five miles from the nearest help. I wanted to make the commute safer, so I went looking for a heavier car and found a 2008 Mercedes R350 with 17,000 miles and at half the listed retail. The car was a tank that got me to and from work in some very crazy snow storms. The crossover was too much car most of the year. Living in Vermont develops a respect for the environment, so while I felt safe in the winter I cringed at the impact of my behemoth on wheels. Gas prices were rising and the car was due for a major breakdown (the warranty was up), so it was time to make a change. So why get an electric car? I was visiting friends and colleagues on the west coast during the summer of 2014. One of them gave me a ride in his Nissan Leaf, and the first thing that struck me was the lack of noise. No rumble from the engine, only a high whir from the motor and the sound of the tires on the road. The car reduced noise as well as air pollution, and made it easier to listen to my a cappella tracks in my iTunes library. It was a shock the first time I stopped at an intersection, no noise or vibration, as if I had stalled the family stick-shift while I was learning to drive. This took some getting used to. Regenerative braking uses the motor as a generator to return energy to the battery. It is an interesting feeling to know that I can return fuel to the tank by using the car. Try that with a gas-powered vehicle. Gas prices were over $3.50 per gallon at the time I was looking to buy, at 20mpg it would cost $14 for the round trip each day. It currently costs about $2.80 to recharge the car battery from 0, giving it a range of about 100 miles. Even with prices for gas at about $2.50 at the time I am writing this, I am still saving about 75%. Armed with a good environmental feeling and some budget relief, I headed into the fall feeling lighter. I became more aware of my energy use. Everytime I turned on the radio or fan I would wonder how much of the battery capacity I was using. It turned out that I could travel to and from Middlebury and still have about 20% capacity. This felt like a good cushion. The next challenge was whether there would be enough time between when I arrived home until I left for work again the next morning to charge the car. 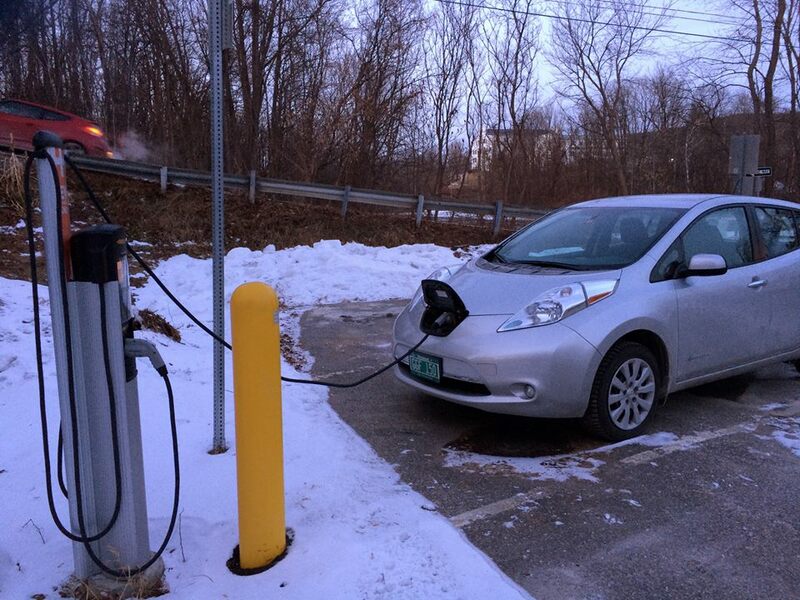 I was able to go two days without an extra charge, which was easily accommodated by using the charging station at the Addison County Regional Planning Commission while getting lunch at Green Peppers. There are a few things that impact the EV during the winter. Heavier tires mean that the car has to move more weight, and the battery has a reduced ability to produce charge when it is cold. Just turning on the heat drops the range by 15% in the dashboard. When the temperature drops between 32° and 0°F, I’ve noticed that the range drops by about 40%. When it drops below 0°F to -15°F I notice that the range is cut in half. Knowing that the charge is severely reduced means that it will have to be charged in Middlebury every day. The closest charging station is Mill St., which has four chargers near the entrance to a commuter lot. On most days the half-mile walk to the Davis Family Library would be pleasant, but it becomes nasty when you discover the wind whipping across the lawn in front of Twilight and down Weybridge St. as you climb out of Frog Hollow. Your breath starts to burn on the coldest days before you reach Storrs Ave. Luckily these days are rare, even in Vermont, and I have compassionate colleagues who take pity on me and give me a lift on the worst days. The ride, itself, is comfortable and feels secure. The battery takes up a lot of area along the floorboard and sits in the center of the car, reducing the sliding pendulum effect when front or rear tires hit a slick spot. It weighs about 1,000 pounds more than the Saturn did, helping it to hug the available pavement. The car can be started while plugged in, meaning you can warm it up without using up the range. I would recommend the Nissan Leaf, even for winter driving, with a few caveats. We are a three car family, I would not have purchased the Leaf it was going to be my only car. The range on the battery means that I would have to stop 3-4 times between my house and Boston, MA, and that assumes that there are enough charging stations along the route. Our Honda Pilot or CRV would be better suited for road trips and the severest of weather conditions. The technology is changing rapidly. There are rumors that Nissan has a 250 mile battery, Tesla is getting close to 300 and is looking to expand to 400 miles. New Leafs have a solar panel on the rear spoiler to charge some features of the car. Leasing is a better option during this stage in the technology’s development. There are home-chargers that will hook up to a 220v outlet, similar to what you plug your dryer into. The dealer quoted us about $1200, but we found a GE model for about $750 that is working just fine. I will keep posting about my experience with the electric car on Facebook and Twitter, and if I generate enough content will pull it all together for a future post. Until then, I am going to continue to enjoy my less-distorted music two hours a day, five times a week, as the scenery changes from white to green. This is a great piece! 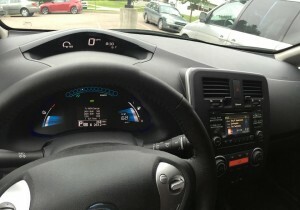 I too drive a Nissan LEAF and love it. We charge at home and, since we have solar panels on our roof, we drive this car 100% solar. This is good for the environment and for geopolitical wellbeing, for sure, but it is really great financially as well: I drive the car for free. The college should have at least a couple of charging stations, like most of our peer institutions. This would benefit you and me, but also the handful of other EV drivers on campus. That would be an easy incentive for the college to provide!